373 other birds have this item in their bag or wishlist! Here at the nest we are all in a flutter, The Embrace Cotton Sweater has arrived! Funky and fun this sweater will help you to express your individual style, all while supporting a great cause. Please note if you usually buy American sized garments, American sizing is 2 sizes smaller than these Australian sized garments, eg size US6 is size AUS10, size US12 is size AU16. I like what this stands for and it is such an inspiration to own a piece of something so special, The fit is great and I like cotton sweaters, comfy all-around and looks good on. Love what this stands for! A great comfy top. Looks great with jeans. After reading the reviews, decided to go down a size and was glad I did. It is quite loose around the neck and shoulders, but narrows in at the band. I was unsure at first whether to keep it - the fabric is not stretchy and is a bit stiff. Might soften once its washed. Looks great with jeans and a black scarf. I love that the purchase funds a great initiative, so have kept it. A customer at my local coffee shop admired my jumper because she knew of the 'Embrace' movement ... it started a great conversation. Plus I love the jumper, it's even more vibrant in the flesh! First order one size smaller, second buy all you can to support this movement, third we should all embrace. Great quality light cotton sweater. This top is so comfy and true to size! #ihaveembraced too so even happier to support Taryn and the BIM! Great lightweight jumper. Love the cause too! Good fitting light weight jumper - perfect for layering just for autumn days. Perfect length in the arms- quite a large scoop neck sits flush against body no gape. Great sweater for layering, comfortable relaxed style and particularly love the Embrace message! I always receive positive feedback when I wear this light weight jumper. Red, white and navy always a winning colour combo. Great casual sweater. Goes with jeans, leggings, shorts. An all round winner. Not fleecy, so good for spring, autumn. And as an added bonus supports a fantastic cause. Love your body!! Very comfortable. A bit large but suitable as a sweater style garment for layering or just on its own. I would normally buy a 22 in a top due to large busts but plenty of room here. Long sleeves but great for winter when it is a bit icy. Not too warm for the cross over coastal weather. Stripes are very smart. Wish it came in a variety of patterns/colours as I would not hesitate to buy more. Great light weight jumper. It will be great for the cooler nights. It is not thick material but will be good for layering. True to size fit. Comfortable & funky. My new fave. Not quite what i was expecting, this sweater is quite thin but comfortable, a bit too boxy shaped for me and as others have said the waist band is quite fitted compared the the rest of the sweater which is oversized. 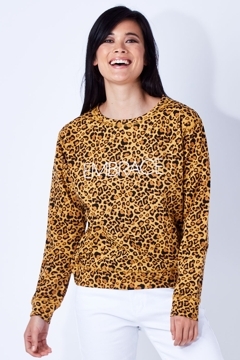 I bought this sweater to support the Embrace movement so i will keep it but i may end up altering the waist band for a less boxy fit and more oversized slouchy look . Material is nice and soft though. I love this top, I'm usually a size 14 and should have stuck with that - but I'm happy to keep the 16. This has become a favourite go to, so easy and comfy to wear. I definitely recommend this one! After seeing the documentary Embrace and joining their campaign, I was excited to see a line of clothes I would actually wear. The sweater is well made, the white cuffs and waist sit well and I love the colours. Love the pattern and the fact the sweater is cotton. It is a bit of a loose boxy shape, but very comfy. This is a nice lightweight jumper but is a funny fit. The neck is a bit looser than I thought and the band at the bottom a bit tighter. It will be a useful addition for the in between season and I'm sure I will get lots of wear out of it. It's a good length and nice fabric. Just love this top. Its not too bulky, but still warm and great over workout gear or with leggings or jeans. Casual or with boots. My kids say "oh Mum! You always wear that top!!" This is the most fabulous jumper I have. It is thin but warm and very comfortable. I got a size 20 as I like tops big and long in the arms. I absolutely love this sweater - beautiful quality and lovely colour combo. Nice soft fabric. Fits well and simply feels nice to wear. Like the fabric, thought it was black when I ordered it! Looks good with my jeans. Shoulders are a little big, but I wanted it to be a bit sloppy joe. It is tighter around the hips but not too tight! It's fun!